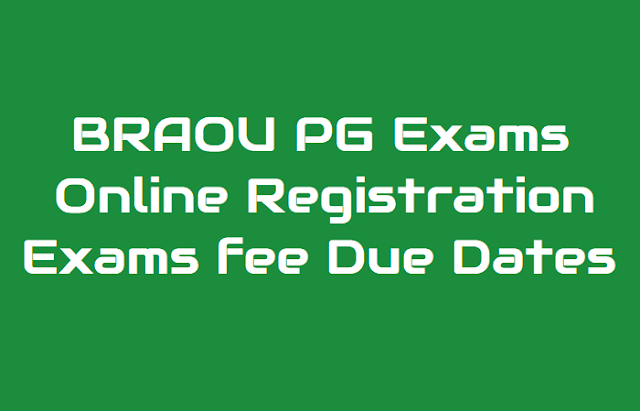 BRAOU PG Exams Online Registration 2018 notification, MA, MCom, MSc, MBA, MLICSc, BLISc Courses Exam Fee notification: The Second Spell Examinations for Post Graduate Programmes i.e. M.A., I & II Years (Economics, History, Political Science, Public Administration, Sociology, English, Telugu, Hindi & Urdu), M.A., I Year (Mass Communication and Public Relations), M.Com., I & II Years, M.Sc., I & II Years (Mathematics, Physics, Chemistry, Botany, Zoology, Environmental Science and Psychology), M.B.A. I, II & III Years, MLISc., and BLISc., Programmes of Dr. B. R. Ambedkar Open University are scheduled to be held as per ist time table from 2.00 pm to 5.00 pm. BLISc must pay the practical fee including the Theory Exam fee by way of single payment). Please keep a Xerox copy of the print out received by the candidate after registration and uploading the information through online and T.S./A.P. Online payment receipt for future reference whenever necessary. For the details of examination fee, please see the Note appended. The PG Spell-II Examination Online Registration and payment of examination fee commences from 17-07-2018 and last date for Online Registration and payment of examination fee is 24-11-2018. For further details candidates may contact their study centre. The Examination Registration Forms without online are not allowed by the University and no further Correspondence shall be entertained in this regard. Examination Schedule of P.G. I & II Years, MBA I, II & III Years,BLISc., and MLISc., Programmes for 2018-2019. The students are advised to visit the University portal at www.braouonline.in and click on Exam Registrations, PG Exams for Spell – II. Window opens. Then, for the registration enter your admission number. Students details with hall ticket number, name, father name, date of birth, Social status, Medium and fields for programme of study, year of examination (I or II or III) and courses will be appeared. Select your choice of paper for examinations. After filling all the fields in the online application / registration form, the student should upload it by clicking on “SUBMIT” and take a print out and retain it with them as record. The print out comes with a “9” digit application number. If any student wants make any changes in the registered application form in respect of applied courses, it should be made before proceeding for payment. There is an option for this. No changes are accepted after making payment. The candidate should pay the required fee at any T.S / A.P. Online Centres or through Debit/Credit card with this application number only and collect/print the payment successful receipt and keep it for future reference. For further details, you can contact HELP DESK PHONE NUMBERS 040-23680251 and 040-23680350. This is to notify that the First Spell Examinations of I & II year Post Graduate (PG) Programmes i.e. M.A., (Economics, History, Political Science, Public Administration, Sociology, Mass Communication and Public Relations, English, Telugu, Hindi & Urdu), M.Com., M.Sc., (Mathematics, Physics, Chemistry, Botany, Zoology and Environmental Science, M.Sc., Psychology (New & Old Syllabus), M.B.A. I, II & III Years, MLISc., and BLISc., Programmes are scheduled to be held during December 2018 to Janaury 2018 from 2.00 pm to 5.00 pm. 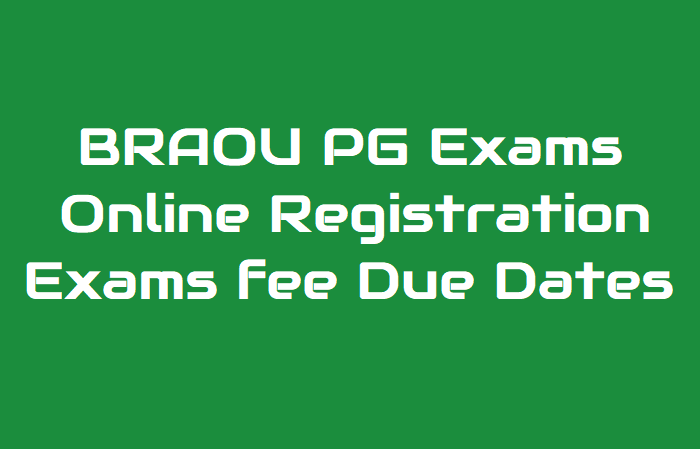 For Spell–I online examination registration candidates are advised to visit the portal at www.braouonline.in and click on Examination Registrations/P.G. Exams Registration form. The prescribed fee may be paid at any T.S. / A.P. Online Centre or through any Debit / Credit card on or before 24-11-2018. Last Date for Examination Online Registration : without late Fee 24-11-2018. PG Examination Timings : 2.00 P.M. to 5.00 P.M.